You are currently browsing the Athletic Tape Info Center blog archives for July, 2009. The hottest trend in athletic therapy today is kinesio taping – application of a thin, stretchy athletic tape on injured or overused body parts. Satisfied users have reported rapid relief of pain, reduction of swelling and even improved performance from the taped muscle groups. Depending on the method of taping, kinesiology tape can be used to either inhibit or stimulate a muscle or muscle group. The following suggestions apply to both Kinesio Tape (Kinesio Tex Tape), which comes in rolls, and SpiderTech pre-cut kinesiology tape, which is already configured for specific body parts. If a muscle is suffering from fatigue and overuse, an inhibitory taping technique should be used to assist in relaxation and recovery and/or relieve pain. Begin by placing the muscle in a stretched position. Apply the anchor end of the tape to the insertion (end) of the muscle with no stretch on the tape. Continue applying the tape, ending at the origin (beginning) of the muscle. There should be only a slight tension/stretch in the tape. Since kinesiology tape is already stretched 25% when the backing is applied, simply placing it on the muscle as it comes off the backing should create the optimum stretch. Kinesio taping can be equally effective to stimulate weak or poorly-toned muscles as well as for rehabilitating muscles after the acute phase of an injury. 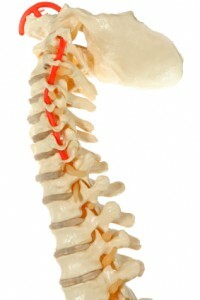 In these situations, the tape is stretched instead of the muscle. It is also applied in the opposite direction, beginning at the origin and ending at the insertion. Except for the anchor (beginning) and the tail (end), the tape should be stretched slightly as it is applied to the skin. Kinesiology tape is a generic term for a thin, stretchy tape that can be applied to a wide variety of injuries and inflammatory conditions and quickly produce amazing results. 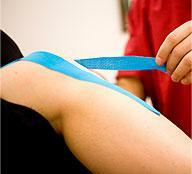 The best known brand names are Kinesio Tex Tape (aka Kinesio Tape) and SpiderTech Tape. Other than making a totally cool fashion statement, what is it about this colored tape that has created hundreds of thousands of converts in the last year alone? 1. Kinesiology tape has virtually identical in thickness and elasticity to human skin. This means that once it’s applied, you barely know it’s there. Most applications can be comfortably worn for up to 5 days. 2. When stretched kinesiology tape is applied over an inflammed area, the skin is gently lifted as the tape attempts to return to its unstretched state. This can be seen as a slight puckering or wrinkling of the taped area. This lifting action creates a space between the skin and the inflammed tissues below. reducing pressure on the blood vessels, lymphatic vessels and nerve endings in the injured area. Improved blood flow enhances delivery of oxygen and nutrients to the injured tissues, accelerating the healing process. Improved lymphatic flow reduces swelling which relieves pressure on the pain receptors providing rapid pain relief. 3. Because kinesiology tape can be worn 24/7 for up to 5 days, the therapeutic benefits are available to the body around the clock for the entire time it is worn. It’s kind of like have non-stop physical therapy, day and night, for 5 days. This fact alone greatly accelerates the healing process, allowing a return to normal activities much sooner. add comment | Comments Off on How Does Kinesiology Tape Work? Recently, more and more chiropractic patients have been leaving their practitioners’ offices sporting a new fashion statement – a brightly colored athletic tape that can be applied in a variety of configurations on any part of the body. The generic term for this unique therapy is “kinesiology tape.” The two leading brand names are Kinesio® Tex Tape and SpiderTech™ Tape. 1. When properly applied, kinesiology tape can relieve pain almost immediately. This can break the vicious “pain/spasm/pain” cycle that can prevent a chiropractor from performing an effective adjustment. 2. Because a single application of kinesiology tape is typically worn for 4-5 days, the therapeutic benefits of a chiropractic visit can continue 24/7 for an extended period of time. 3. Kinesiology tape provides chiropractors with a simple, effective tool to address soft tissue and myofascial issues, in addition to the spinal subluxations more typically treated. 4. The elasticity of kinesiology tape allow a chiropractor to create an application that can guide muscles and joints through correct movement patterns without limiting range of motion. 5. Depending on the method of application, kinesiology tape can be used to either relax overused or spasmed muscles or to activate weak, underused muscles. This allows each application to be customized to the needs of the patient.